It has free wifi, central heating, fully fitted kitchen with free tea/coffee. There are laundry facilities, a barbeque area and a workshop space which can also be rented by groups. This is a hostel with a difference. Ballyeamon Barn has its own “session house” where visitors have the chance to meet local musicians and singers during regular sessions of storytelling and music, free and open to all. Owner Liz Weir hosts groups of visitors who want to experience the “real” Northern Ireland, meet the locals and feel part of the community. They do so within the rich culture and scenic beauty of the Glens of Antrim- with its folklore, music and dance. Liz also offers storytelling workshops and can arrange local walking guides, horse riding, yoga and 'pamper' sessions for visitors. You will leave with lots of stories! brilliant experience. Liz is so welcoming. It was home from home with the added bonus of some singing ang storytelling. I would highly recommend this place! We loved our visit to Ballyeamon Barn! Liz was a welcoming host and a delightful person to meet. She invited us to join her for her weekly storytelling session and was flexible and accommodating around scheduling changes on our end. This is a very unique hostel site and I'd recommend it for anyone seeking an adventure in a rural setting. It's a bit challenging to get to without a car but it's doable! I loved my stay here, I wish i could have stayed longer! So friendly and welcoming and in a beautiful location. Above and beyond what i would expect from a hotel never mind a hostel! A hidden gem, definitely coming back! Fantastic building, equipped with everything you could need and outstanding value for money. Liz is a very dedicated host and really goes that extra mile to make her guests' visits special. Great hospitality, lovely facilities in the middle of the beautiful and peaceful Irish countryside. Highly highly recommended. Beautiful setting and warm hosts. Very magical! Super home-y and very friendly staff. We definitely enjoyed our stay. 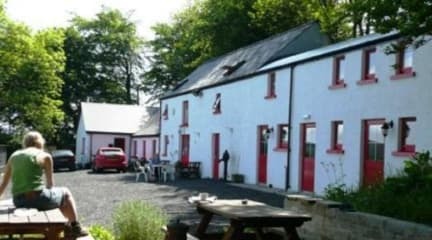 The Barn is located in area of picturesque Glenariff Forest Park, a great springboard for hikers & bikers. It's nice and quiet place but a bit remote; it took us awhile to get there from Bushmills (taking a bus & hitch-hiking). The staff was friendly and helpful (nb Liz was not present). We were there in the off season and the only guests at the time. The place itself is basic, but everything you need is there. The kitchen was well equipped so it is possible to cook. We enjoyed our stay there.